Lady Bulldogs Win Thriller to Repeat as Class 5A State Champs! 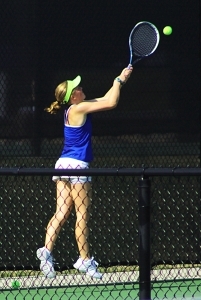 A four-hour singles match decided the Class 5A Girls’ State Championship as Grace Pietkiewicz pulls out three-set marathon to clinch the Chamblee Lady Bulldogs second consecutive state championship at the Rome Tennis Center at Berry College on Saturday. Chamblee and the Kell Longhorns were knotted at 2-2 with Pietkiewicz and Kell’s Emily Dearing in a winner takes all match at No. 2 singles went to a third set after Dearing rallied from a 7-5 loss in the first set to win the second 6-3. Pietkiewicz got a pair of service breaks on the way to a 3-0 lead in the deciding third set. Dearing answered reeling off three wins in a row herself to knot the pressure packed set at 3-3 with a service break of her own. Dearing was serving to take the lead in the seventh game of the set, but Pietkiewicz ran off three straight points to break Dearing back to go up 4-3. After a medical timeout for Dearing, the Chamblee junior went deuce twice on her serve before Dearing failed to get a return over the net to give Pietkiewicz a 5-3 advantage. Dearing wasn’t finished as she overcame a match point and used a nice volley for a winner to close the gap to 5-4. After the switchover, Pietkiewicz stepped up to serve with a chance to close out the match and seal a second consecutive state title for the Bulldogs. She jumped out 40-15 only to have Dearing battle back to deuce and stave off another match point. Dearing hit a shot wide and the advantage went to Pietkiewicz for another match point. Pietkiewicz served, Dearing returned and the Chamblee junior stepped forward and hit a low shot in front of Dearing. The Kell junior’s shot was low and into the net giving Pietkiewicz and the Lady Bulldogs the victory four hours after they had started. The final at No. 2 singles was 7-5, 3-6, 6-4 as Pietkiewicz wrapped up her junior campaign at 16-1. Chamblee had jumped out to the early 2-0 lead with wins at No. 1 doubles and No. 3 singles. Senior Olena Bulikha and junior Madeline Meer picked up the first point with a 6-3, 6-0 victory over Kell’s Alex Rapplean and Annabelle Colmenares to finish undefeated on the season at 11-0. Freshman Neena Katauskas won her first set at No. 3 singles easily 6-0 but had to rally from a 3-1 deficit in the second set to win 6-3 for the second point. Katauskas finished the season a perfect 15-0 in singles play. The Longhorns (18-4) battled back from the 2-0 deficit to tie the match as 2-2 with wins at No. 1 singles by Nicole Abel 6-4,6-0 over Chamblee’s Madison Trinh (11-3) and at No. 2 doubles by Abby Johnson and Samantha Goss 6-2, 7-6 (tiebreaker) over Chamblee’s Emilya Ershtein and Lila David (2-3). 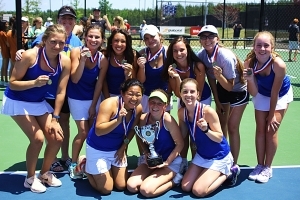 The victory for Coach Larisa Tulchinsky’s Chamblee squad wrapped up a 22-0 record on the season and kept alive their consecutive match win streak at 47 during their two-peat. Senior Olena Bulikha was forced into doubles after an early season ankle injury and ends her career without a loss with a 56-0 record in singles and 13-0 in doubles this spring. Chamblee became just the second DeKalb girls’ team to win back-to-back state championships since Dunwoody’s 1980 and 1981 state titles. The victory was DeKalb’s sixth state title in girls’ tennis and extended the county’s state title streak to 18 years with at least one title. The Lady Bulldogs’ win marks the 309th state championship for the school district.